EVENTS: Kid Electric presents Off The Wall, TWEATJUICE! Oooh! Here’s two great events I am excited about coming this weekend! One of my favorite promoter, KID ELECTRIC CONCERTS, is presenting Michael Jackson’s Off the Wall album in it’s entirety. Friday, August 28th, 2009, 8pm @ the Mercy Lounge. Purchase tickets HERE. Not familiar with Kid Electric Concerts, well it’s an awesome organization that has local indie artists perform classic albums to benefit local non-profit organizations. Kid Electric founder, Toya Haynes, promises that this concert is going to be a certified party, especially because it would have been Michael Jackson’s 51st birthday. I’ll be there, I hope to see you there too! 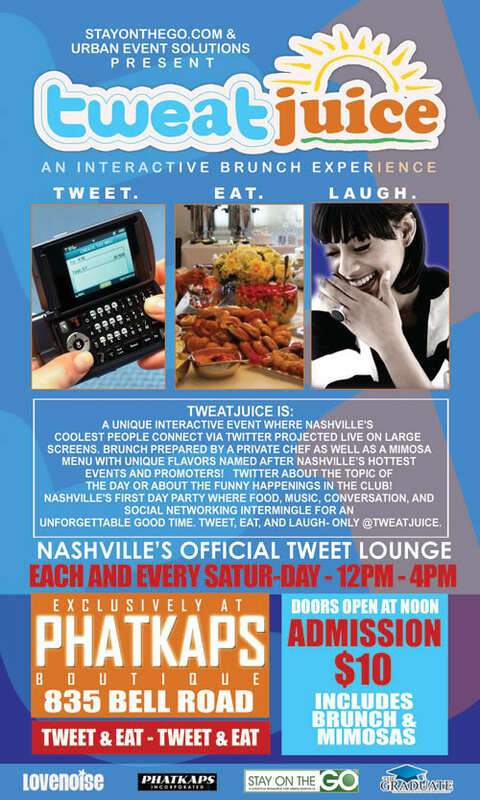 On Saturday, August 29th, 2009 from 12p – 4pm join your fellow Twitter folks at TweatJuice. What is TweatJuice is an interactive brunch experience where you can meet your favorite Twitter followers, tweet about hot topics, have brunch, and shop. TweatJuice happens every Saturday at PhatKaps, 850 Bell Road, Antioch, TN. There’s a $10 admission which include brunch and mimosa’s! Purchase tickets by clicking HERE.